Advisors know the true value of life insurance, but some consumers are grossly misinformed. Here are 10 of the biggest life insurance misconceptions. If you’re splashing out thousands on a new car to impress your clients, the advice is choose your colour carefully. Whether you’re a supervisor of one or the head of an entire company, leadership is a challenge. As a leader in your organization, your success directly impacts the success of the people on your team. The right leadership qualities can propel others forward — but the wrong ones can bring everyone down. In a Monster survey, when asked to rate their boss on a scale from 1 to 5, with 1 being “horrible” and 5 being “excellent,” 38% of respondents chose 1. Only 17% chose 5. So when your friends complain about their horrible bosses, they may not be stretching the truth. These stats are bad news to all bosses. A study by Accenture shows the top four reasons employees quit, and 31% said that it was because they disliked their boss. Among the top five things employees want to change about their managers, many of them are about leadership qualities such as communications skills and empathy. Can these things actually be changed? In other words, are leaders born or made? Are the characteristics of a good leader learned or instinctive? This powerful quality allows leaders to connect with their employees on a deeper level and understand how they’re feeling. It’s about putting yourself in other people’s shoes and spending more time listening rather than talking. When you have this level of understanding, you can make better decisions for everyone. We’ve all known a leader who is so in love with what they do and who believes so deeply in an idea or cause. It’s contagious! And passion sure can’t be faked. Passion is what motivates employees to go the extra mile, and most of the time, you’re either passionate about something or you’re not. There’s not a lot of middle ground. A humble leader is one who gives credit to others when deserved, who calls on colleagues for help, and who realizes that the success of the company depends on all employees, not just the big boss. Ego is not something that develops overnight; the level of your ego is usually a part of your innate personality. An effective communicator clearly explains tasks, deadlines, and expectations while inspiring and motivating a workforce. Sure, some people are naturally more articulate or communicative than others, but being a skilled communicator takes time and practice. It may be easier to have tough conversations behind closed doors, but employees want to know what is going on. The best leaders share where the company is headed, what is going right or wrong, and what needs to be improved. If this were an innate quality, we would surely have more trust in the world. Unfortunately, building trust is one of the hardest things to do, and it takes a lot of time to foster personal relationships, act on promises, and show that you are someone of your word. A healthy balance of natural capabilities coupled with the desire to learn seems to produce the best leaders. When you look for your next leader, don’t forget to consider those natural capabilities. A common error is to promote a top employee to a leadership position just because they’re good at their job. While there are definitely advantages — they already know the team’s goals and have a relationship with the other team members — you can run into a speed bump (or two) as your employees deal with their coworker becoming their manager. We know that leaders need qualities like communication, empathy, and people skills. And these could be areas where your new leader hasn’t had a lot of practice or instruction. Or maybe they have these skills, but only in a peer-to-peer context. Even if the new leader communicated well and showed empathy in their interactions, they aren’t workable anymore. Leadership styles that worked as a coworker may not cut it as a manager. And a newly appointed leader might work on the wrong traits. I have to show that I’m the boss, they think, and enforce a strict hierarchy. Or I have to prove I can do it all myself, so I can’t ask for any help. Instead, they need to find ways to prove their competence and authority that mesh with the qualities of a leader that employees ask for. Even if your first-time manager has a lot of potential, they still have to navigate the transition (and all the obstacles it comes with). Set them up for success by mentoring them in the important skills like communication — and especially how to shift those skills from what they used as a team member into what they’ll need to lead the team. 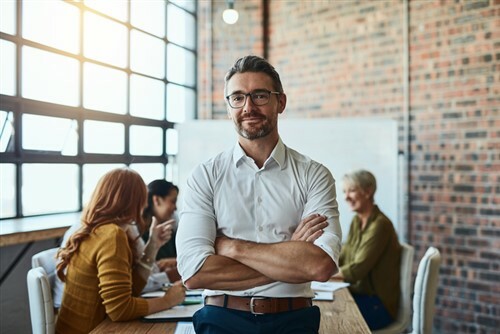 Not only will this help them, but by supporting your employee’s career development, you’ll also be fulfilling one of your own most important duties as a leader. Accountemps found that over half of employees say they’ve worked for a micromanager. Yikes. 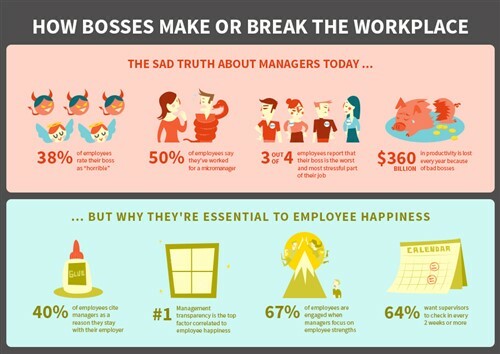 And those micromanagers hurt the morale of 68% of them, and productivity of 55%. Double yikes. When you delegate a task to an employee, you’re constantly “just checking in.” If you had the option, you would probably embed a tracking device in your employees. You believe you can do everything faster and better than the people who work for you. After a task is assigned, you take it back when you see that it’s not going the way you think it should. It’s great when employees take initiative and jump on a project. But you think it’s even better that they run everything by you — even the most basic task. When you assign out a task, you also assign out the “how.” You need to make sure employees are performing the task the “right” way. Discussions never seem to go anywhere. You continue to gather input but keep asking questions in hopes of finding that perfect decision. Fact is, you’re beating a dead horse by doing that. You want to keep the project moving, so every task is equal in importance. From a design’s font size to its overall layout, you believe an employee must put equal amounts of focus into all parts. You don’t trust your employees enough to task out the work, or you like keeping the fun, creative parts of a project for yourself. And you’re wondering why you’re drowning? There’s a zombie apocalypse outside? You’re still working. You’re afraid that everything will go to chaos if you’re not there to lead (control). Your team’s production rate is low, and they’re avoiding going to your meetings or talking to you. You can’t be the one to blame, right? You’re unable to retain employees. Sure, they were bright-eyed and bushy-tailed when they first started, but you’ve worn them down and now they’re out the door. If you’re worried about being one of the bad bosses that plague the workplace, there is a five-step plan to gain back respect from your workforce. Are you having your employees work extra hours, come in on weekends without so much as a thank you? Maybe you slipped up on social media. Or you micromanage, never allowing your employees to take the reins they should be empowered to have. Whatever it is, nail down your poor leadership qualities — and be honest with yourself. This is the time to be humble. Admit your shortcomings to your staff, and be clear and direct. Now is not the time to be defensive; lay it out on the table. Your employees will appreciate you for it. Take that feedback and make a plan for the future. This is where you are not just a boss but a leader. And you need a plan to showcase strong leadership qualities that reflect the needs of your workforce. According to Forbes, two crucial elements of this plan should be trust and transparency. Employees want to work for a leader who is forthright and open. And the trust should go both ways: employees should be able to trust their leader, and they want that trust right back, empowering them in the workplace. Implement specific goals and metrics for moving forward in this direction. A plan is nothing without the follow-through. Execute. And you should never be unsure of how your plan is working, because that open door of communication should be delivering constant feedback. The importance of great leadership qualities in the workplace is too high to leave bad bosses unchecked. Take time to recognize both the good and bad in yourself so you can maximize your team’s potential.